Boston Ballet, JFK Center, Interlochen, Sarasota Ballet, Oklahoma Ballet, Ellison Ballet, Kirov Ballet, Juilliard School, as well as overseas organisations like Barcelona Ballet, Doha Choir, Doha Community Orchestra, Doha Players, Azerbaijan State Opera and Ballet Theatre, Baku Music Academy and etc. Master of Music and staff pianist for Houston Ballet for last 7 years she has excellent sight reading skills, thorough knowledge of classical music as well as folk music of different countries, is proficient in putting music into notes, playing by ear and memorising music. 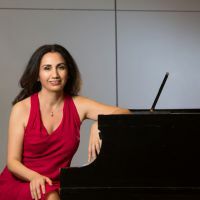 Plus to having a successful accompanist and soloist career she is a private Piano, Collaborative Piano, Ballet Pianist and Music Theory teacher, prepares students for internationally recognised exams and contests. Tarana also teaches for summer classical music/art camp for which she developed a program encouraging kids' creativity and introducing them to different kind of art. She has also studied Marketing and PR and holds MBA degree. Available to travel. Rates may vary based on location. For performances, auditions, or exams, there will be a flat performance fee. It will depend on the scope of the performance.